Family Man - Notes: 290-299. 291. Whoo boy some serious guilting going on in the ol’ den. Rectorship in the 18th century German university structure was as much about maintaining town-gown relations and as it was internal administration. Universities created their own economic gravity well, employing people directly as well as funneling a massive amount of money to local vendors, but that just put them squarely in the hot-seat of municipal politics. A Rector would be well advised to keep on everybody’s good side lest somebody decide to take out their grudge on the University’s pocketbook. Perhaps this is part of why the seat was rotated so frequently; it must’ve been burnout central. 292. EXPOSITION INCOMING! TAKE COVER! As previously noted, “Familienwald” is literally “The Forest of the Family” (and the town would most properly be called Familienwaldstadt). Luther’s Latin translation is correct – Valley of the Wolves. 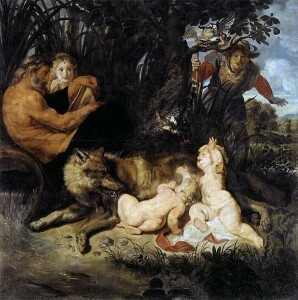 “Romulus and Remus” – the central founding myth of the city of Rome. They were twin boys born as the result of a secret union between Mars, the god of war, and a princess forcibly sworn to chastity by her evil uncle. Following a popular mythological trope, the infant boys are tossed onto the river Tiber. They miraculously float to safety and are adopted by a she-wolf, then fed by a woodpecker who’s actually a cursed king (don’t ask). Eventually they’re found and reared by a shepherd family. The boys go on to avenge their mother’s murder, then get into a squabble over the city they want to found. Remus gets killed in the ensuing scuffle, and Romulus, apparently not deeply bothered by this outcome, names the new city after himself. Mythology! The motif of the twin infants being nursed by the wolf was very popular in ancient Rome, turning up in mosaics and on coinage around the Empire. I also drove myself slightly batty trying to figure out what a Roman scout would wear during the Marcomannic wars (not everybody was trussed up in lorica segmentata). Then I remembered that I’m making a comic book and silhouettes are sometimes more effective. The shape of this fellow’s helmet is generally correct, as are his leg wraps, and for the rest you can take it up with your own imagination. Since the Romulus/Remus myth was so central to Roman identity, this would definitely fall under the category of disruptive omens. There is no shortage of actual reports of military movements being biffed by the wrong kind of bird flying overhead. For that matter, Romans often believed in a version of werewolves (versilles), men who turned into wolves and back again. There’s a great werewolf story in The Satyricon, by Titus Petronius Arbiter, in which a man turns himself into a wolf by stripping naked and then peeing a circle around his clothes. Seems perfectly respectable. 293. All this wolf business makes the legion commander’s reaction seem fairly well-advised, but not everybody had so much patience or credulity when it came to omens spotted by amateurs, as opposed to an official augur. Faking omens to get out of things was not an uncommon gambit in Roman society. And so the poor commander was picked off by the Quadi, who were a smallish but still dominant tribe in Moravia at the time. Not much is known about them – the archeological record hasn’t turned up many distinguishing features , and even “Quadi” was just the Roman name for the tribe. Meanwhile I am doing my best to draw entertaining things happening behind all this exposition. 294. That’s Jan, the angry one of the two littermates, chewing out Zdenko. Rome had already passed its prime when Marcus Aurelius became Emperor, but it really hit the skids after his death. Rather than legally “adopting” a politically and militarily experienced person as his son and then appointing him as heir, Marcus allowed the office to pass to his biological son Commodus. 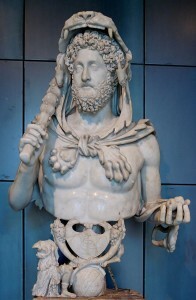 Commodus was a very young man with just three years of experience as co-emperor under his belt when Marcus died, and he turned out to be tragically unstable. You probably know him as the emperor who liked to cosplay as Hercules, or as Joaquin Phoenix. A bishopric is the seat of power for a bishop; and a ducal summer residence is where a duke gets his hunting done when the city is too disgusting to bother with. 297. And now you know everything you need to about those wolf statues around town. Did you recognize our little friend, sitting by her wolf? The Piazza Navona is a square in central Rome, on the former site of the Domitian Stadium from the 1st century CE. It’s shooting distance from the Tiber river (that’s Tiberis to the Romans, Tevere to the Italians) and other historic landmarks like the Trevia Fountain, the Castel Sant’Angelo, Saint Peter’s Basilica, the Circus Maximus and the Roman Forum. You may also recognize it from The Da Vinci Code, heaven help us. 298. Jan is getting fresh with his father’s mate. His tail is up, which is usually something only dominant wolves do. In the next panel, his tail is parallel to the ground, which is an attack posture. 299. “Jaeger” means “Hunter.” I suspect Herr Jaeger is rather smug about this fact.